To think that one of the biggest stories to come out of Broadway this past year began in Chicago less than one year ago. The wild success enjoyed by actor/playwright Tracy Letts' August: Osage County all started last summer at the Windy City's celebrated Steppenwolf. 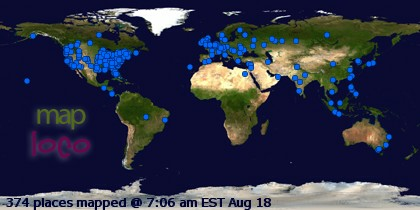 And I was there! I know I'm not necessarily the first theatre blogger to have written about this stunning play, but I know my SOB Review last August sounded the initial clarion call for many of you. While one feckless critic elected this past Sunday to try raining on this brilliant play's parade, he's the only one who ended up getting wet. He's clearly in the minority. Mind you, I don't begrudge him his opinion one iota, but geesh, isn't it a little fraught, if not tacky, to finally reveal his hand on the very day the Tonys were to be handed out? The night before the Tonys, I took in the second-to-last Broadway performances by Deanna Dunagan, Rondi Reed, Francis Guinan, Ian Barford and Jeff Perry in their beloved August: Osage County. The show was hitting on all cylinders, chugging like a steamroller. Only it didn't flatten anything -- its characters, the storyline, etc. If anything, the work has become even more multi-dimensional, more potent and intensely vivid, more so than on my earlier visits. You see, this marked my third time passing through this modern masterpiece, and now that it's settled into the intimate Music Box Theatre, it was my third venue. Each time I've seen the show, a different actor has portrayed patriarch Beverly Weston, starting with the late Dennis Letts (Tracy Letts' father) in Chicago, then Munson Hicks at Broadway's Imperial Theatre (who bravely took over during Letts' illness and subsequent death), and now Michael McGuire at the Music Box. All three actors have certainly imbued their Beverly with their own unique stylings. Today, McGuire is succeeding with a surprising amount of laughs. Still, I must admit to having enjoyed most the quiet, dignified shadings Letts brought to the role. During the performance I saw last summer in Chicago, his brief time on the stage was so effective and enthralling you could hear a pin drop. I don't know all these people, I assume they're associated with the play. Writing is better than acting. You get to use your words, you don't have to be there eight times a week and I can guarantee you that this moment beats the hell out of auditioning for "Jag." I see some of you auditioned for that, too. I want to thank the Tony committee for including a play with the other nominees. You know you're pretty stout company when Mark Twain doesn't get a nomination. Particularly Jeffrey Richards, Jean Doumanian, Steve Traxler and Jerry Frankel. They did an amazing thing. They decided to produce an American play on Broadway with theatre actors. (Emphasis added) I see some of you are theatre actors, too. I want to thank Steppenwolf Theatre, Martha Lavey, David Hawkanson, our board, our staff, Ed Sobel, Erica Daniels, these people have really helped foster the environment in which this play was made. A special thanks to our Chicago theatre community, they are the ones who made this possible. Thank you very much. 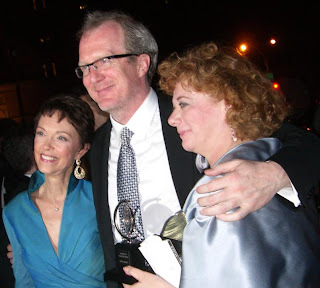 Here's to Tracy Letts, Deanna Dunagan, Rondi Reed (the three are pictured above in an exclusive SOB Photo), Anna D. Shapiro and Todd Rosenthal on their richly deserved Tony wins, and congratulations to Steppenwolf for doing its part in making Broadway plays relevant to American audiences once again. Click here to check out Steppenwolf's very own August: Osage County blogs. What a shame our paths didn't cross this weekend! I'm taking in Estelle Parsons soon as I've always wanted to see her onstage - and well, why not? Glad you both had a joyous weekend. TAAL, Can't wait to hear what you think of Estelle Parsons! Another great picture, Steve! And you may not have been the first to wax poetic about August: Osage County, but you definitely made me want to see it. You were very enthusiastic, and rightly so! I agree about the Times article. It was very tacky and ungracious, especially on the morning of the Tony awards. And I don't agree with him at all in the way he summarily dismissed In the Heights, Passing Strange and August: Osage County. I think all three of them have a great deal to say about families, about our lives as Americans and just about life in general. I'm very honored that I had a chance to see the play with the late Dennis Letts. Tracy Letts also dedicates the play to his father, which is a wonderful lasting tribute. Strange: Passing In The Heights For Best Musical?